The Tru Ruts crew has been putting in work, both on stage and behind the scenes, for a very long time. A record label, a theater production company, a film studio and a Twin Cities cultural institution, Tru Ruts is dedicated to supporting talented, forward-thinking artists, putting on events that go beyond the same ‘ol, same ‘ol, and nurturing the next generation of young writers and performers. Join us in celebrating some big steps made over this past year: national distribution, slam championships, high-profile performances, critically-acclaimed album releases, successful youth programs and much more. And THANKS for all the support! Junkyard Empire, El Guante and e.g. bailey are teaming up for a tour in your area! This electric combination of up-and-coming artists merge the genres of jazz, hip-hop, spoken word, and indie rock, at the height of their craft. In an evening that will range from spoken word to hip hop, jazz to indie rock, audiences will not leave disappointed. There will be something for everyone. For the underground heads, Guante will grab your expectations of hip hop and shake them loose; he is also said to be on the verge of national exposure. 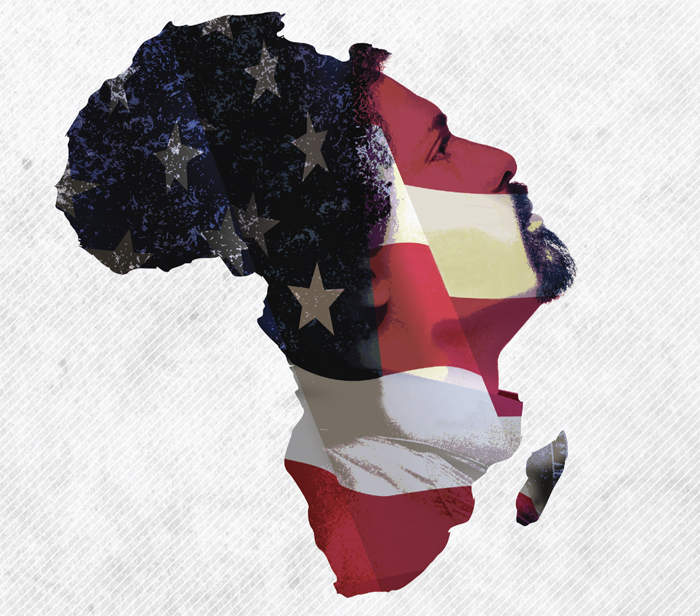 For the politically savvy music lover, Junkyard Empire’s blend of jazz and funk grooves mixed with socially-conscious rhymes are sure to move bodies and captivate minds. Spoken word extraordinaire, e.g. bailey, works as fluidly with musicians as he does with just a microphone, and his effortless ability to marry words with music pushes the spoken word envelope into a fresh musical realm. This tour performance would be a great addition to your calendar. Their infectious energy and music will capture any crowd. The Verbal Graffiti Tour extends across the country, from the West Coast, to the East Coast, with stops in the Midwest. The dates of the tour cover the months of October, November, December and January (2010). Additional dates for November, December, and West Coast dates for January to be added. If you are interested in spotlighting the tour, interviews, or additional information, please contact press.truruts@gmail.com, or call 612-288-9491. Since the release of the self- produced Rise of the Wretched EP in 2008, there has been a steadily growing buzz around Junkyard Empire. This was no doubt helped by their historic performance at the Minnesota State Capital during the last day of the RNC protests in Saint Paul, where the police stormed their concert and created a stand-off with activists, part of which is featured the acclaimed documentary Terrorizing Dissent. In the past year, they have shared the stage with the legendary Boots Riley and the Coup, Rhymesayers artist Eyedea, Australian urban roots crew Blue King Brown, Rhymesayers artist Toki Wright, and Pulitzer Prize winning journalist Chris Hedges. Recently Junkyard Empire signed with indie start-up label MediaRoots. The label put JE in the studio with avant-garde producer, Brian Susko. During their time in pre-production and at the prized Winterland Studios, a relationship was made that caused the band to push the envelope in a way that they had never done before. It’s now easy to hear how the band’s collective influences in conscious hip-hop, acid jazz, R&B and indie rock all culminate to create a sound that is unique beyond all common recognition. Rebellion Politik is not only the title of the latest EP due out in September, it’s the operating theory Junkyard Empire uses as a force for organization and political action; referred to in the title track from the EP as “the science of survival in a repressive environment.” And to prove it, the album is already garnering inquisitive reactions from the press that can be seen on blogs such as The Hype Machine, Elbo.ws, Perfect Porridge, Midwest Broadcast, URB Magazine’s next 1000 and others. As an MC, Guante’s last album met high critical praise and catapulted him to the forefront of the next generation of Twin Cities’ vibrant hip hop scene; in the past year, he played Soundset ’09 (alongside Atmosphere, the Pharcyde, Brother Ali and more), the anti-RNC festival ‘Ripple Effect’ (alongside Michael Franti, dead prez, Rage Against the Machine and more), along with many other high profile shows. As a slam poet, he’s been the Grand Poetry Slam Champion for three different cities in four years, and most recently became the 2009 National Slam Poetry Champion as part of the St. Paul Slam team. 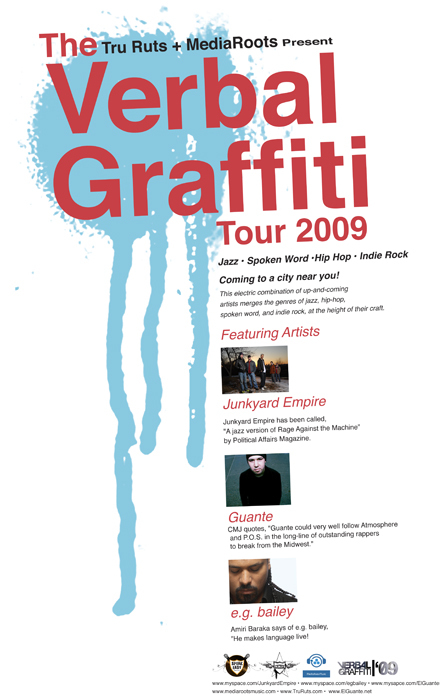 Aside from these artistic endeavors, Guante also found time to curate the massively successful ‘Hip Hop Against Homophobia’ series, contribute regularly to nationally-recognized music site Culture Bully, and lead writing/performance workshops in multiple Twin Cities area schools throught the MN Spoken Word Association. Deemed a true innovator of the spoken word art form, his charismatic yet musical style dances words with sound in and out of synch with verbal play. 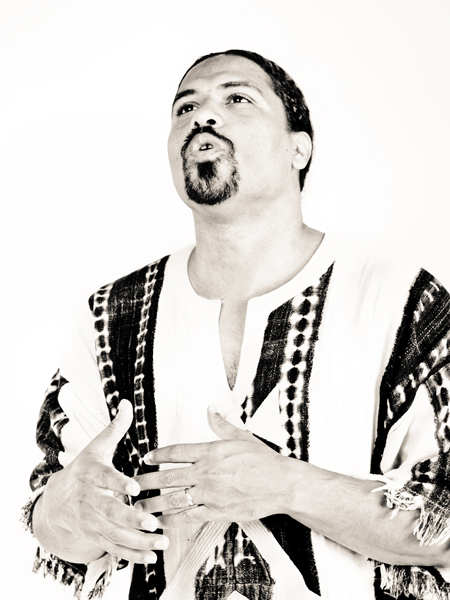 He has appeared in spoken word commercials including ‘Art Connects’, which premiered at the 2008 B.E.T. Hip Hop Awards, and was featured on the MTV, VH1, MTV Europe, CBS, NBC and other networks, in addition to being inducted into the Television Hall of Fame archived at the Modern Museum of Arts in New York. E.G. Bailey is the winner of the Hughes Knight Diop Poetry Award and several of his poems have been published in Solid Ground; the millennial issue of Drumvoices Revue; and Warpland, a publication by the Gwendolyn Brooks Center for creative writing. He was a co-producer of Write On Radio, an award winning weekly literary radio program on KFAI Fresh Air Radio where he is currently an on air personality for the Tehuti Spoken Word show on Sunday nights. As he moves effortless between radio, film, theater, and producing, his live performance is always a treat! Tru Ruts Endeavors is a multi-disciplinary artistic enterprise encompassing a record label, theatre productions, a radio series, visual art exhibits and film productions. It has been a major innovator + trailblazer in the Twin Cities, often producing shows to sold out audiences and critical acclaim. Tru Ruts/Speakeasy Records is a premier record label based in the Twin Cities, with a roster of nine artists and has been called ‘a record label of this generation.’ It has released over 10 albums and EPs, including a number of singles, in addition to producing dynamic shows including KRS One’s sold out return to the Twin Cities in 2008, and a Slum Village show with a tribute to J Dilla, featuring nine of the most respected emcees in Minnesota including Slug, Muja Messiah, Maria Isa, Truthmaze and others. 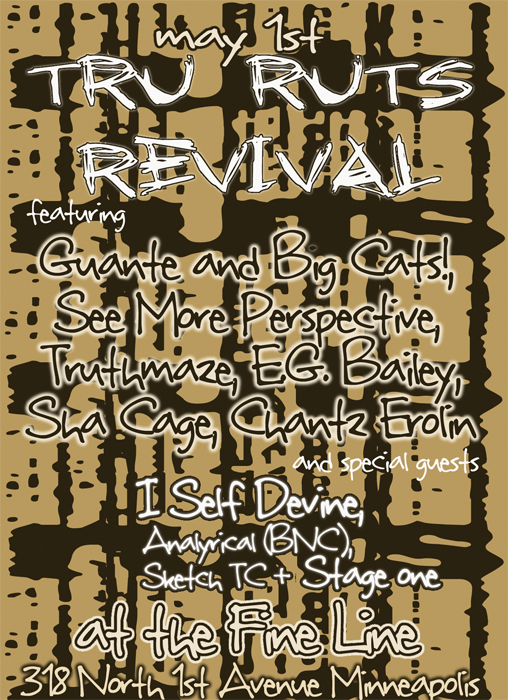 Tru Ruts’ roster also includes Truthmaze, Guante, Sha Cage, e.g. bailey, See More Perspective, Quilombolas and others. MediaRoots is a record label of the web 2.0 era. We are dedicated to bringing you the music and content you want and need. MediaRoots is a safe haven for independent thought, independent media, and independent music. MediaRoots seeks to foster an interactive environment that takes the fan’s input seriously. Here, the artists, companies, and fans contribute to the direction of the business itself as a community of like-minded music lovers, artists, and humanitarians. MediaRoots is what the new music industry must be. MediaRoots is a place for contemporary ideas and new ways of doing business for the mutual benefit of all parties involved. Far from seeking to enrich ourselves, we the people of MediaRoots believe that a more sustainable business model—grounded in equality and respect—is more preferable to a system that has grown out of touch with its listeners and artists. We the people of MediaRoots view the current music industry as an outdated business and aspire to change it. The goal of MediaRoots is to bring about real art that celebrates the musicality and beauty of the medium. Whatever unfolds is up to us. We’ve been unable to find this type of community on or offline, so we decided to start one ourselves. Join us, and together let’s set down MediaRoots. 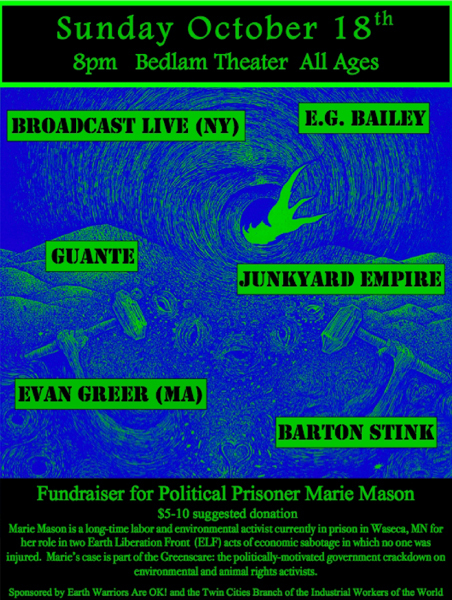 The fundraiser will feature the radical hip hop group from New York BROADCAST LIVE and RiotFolk Collective member EVAN GREER from Boston on their cross-country Steel Strings and Break Beats Tour, as well as three local acts launching their Verbal Graffiti Tour. 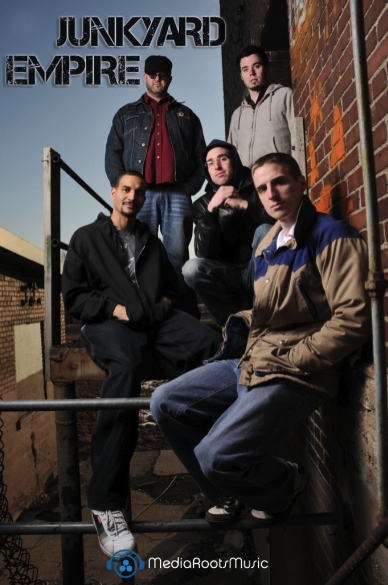 JUNKYARD EMPIRE is a Hip Hop/Jazz/Rock band that just released their new acclaimed album Rebellion Politik. Tru Ruts artists GUANTE -slam poet and mc extraordinaire- and E.G. BAILEY – a true spoken word master and multi-fasceted artist- round out the Verbal Graffiti Tour. Also performing will be the hip hop/electronic/experimental artist BARTON STINK who recently performed at Camp Trans as well as a local show with JD Samson and Johanna Fateman of Le Tigre. Co-sponsored by Earth Warriors Are Ok! (EWOK!) and the Twin Cities Branch of the Industrial Workers of the World (IWW).